A stuntman soars through the air after going up a ramp at Nitro Circus Live at H-E-B Park in Edinburg on Saturday, April 28 2018. 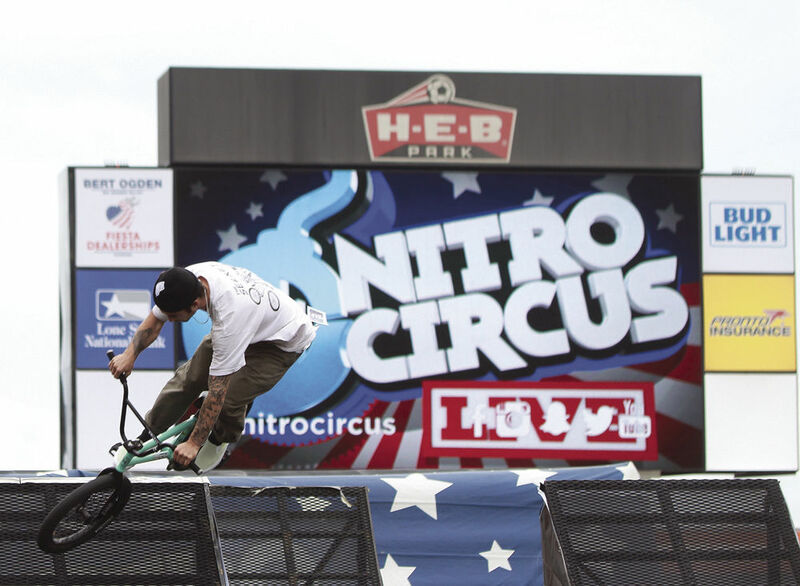 EDINBURG — Adam Jones tightened the bolts of his motorcycle precisely and sipped on a Coors Light beer bottle outside of H-E-B Park on Friday as he prepared for Nitro Circus Live the next evening. “There’s no room for error,” he said. Besides pushing through the jet lag induced by his flight from Australia, the 34-year-old was also working with a wrist he broke two weeks ago after landing wrong during a stunt. 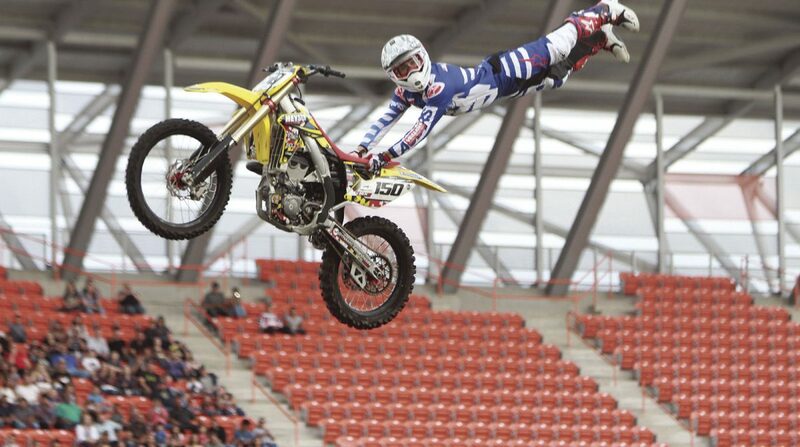 Before the show began Saturday afternoon, a large screen played videos of similar stunts the Nitro Circus team has attempted and that have gone wrong, often resulting in some pretty bad injuries. Moments later, the athletes went on to repeat many of the same routines. On sport bikes, the athletes raced toward a ramp (sometimes in comical vehicles or costumes) then soared through the field until they landed on an inflatable platform. The crowd cheered in the moments the athletes spent in air until the moment they hit the ground. 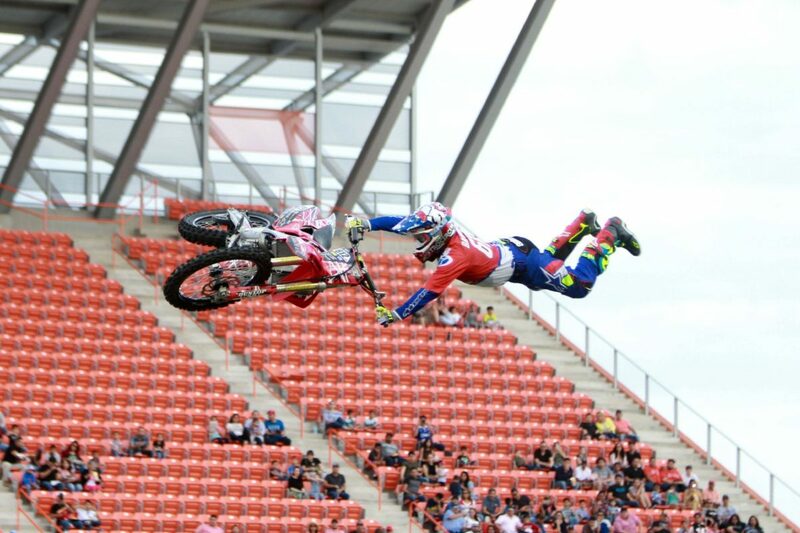 Adam Jones, a stuntman with Nitro Circus, is seen preparing his motorcycle on Friday, April 27, 2018 at H-E-B Park before Nitro Circus Live the next day. A child in the crowd at Nitro Circus Live at H-E-B Park in Edinburg on Saturday, April 28 2018 tries to get the attention of a camera. 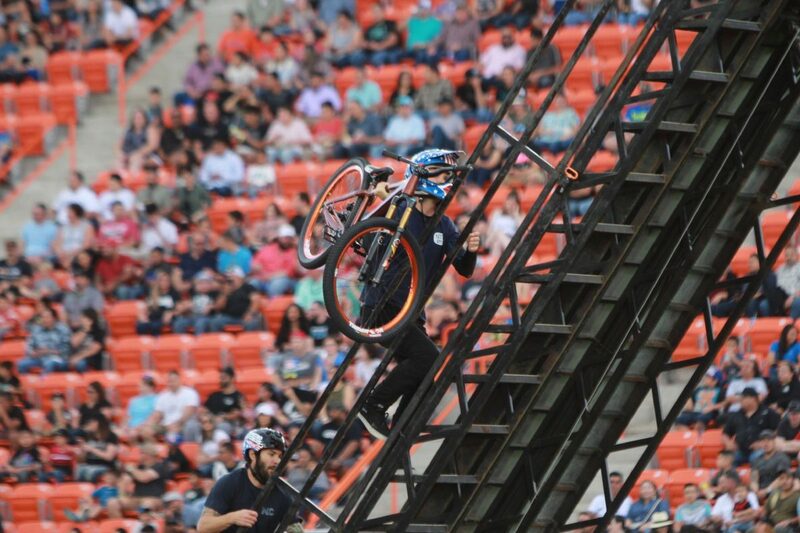 A stuntman carries his bike up the ramp before Nitro Circus Live at H-E-B Park in Edinburg on Saturday, April 28 2018. 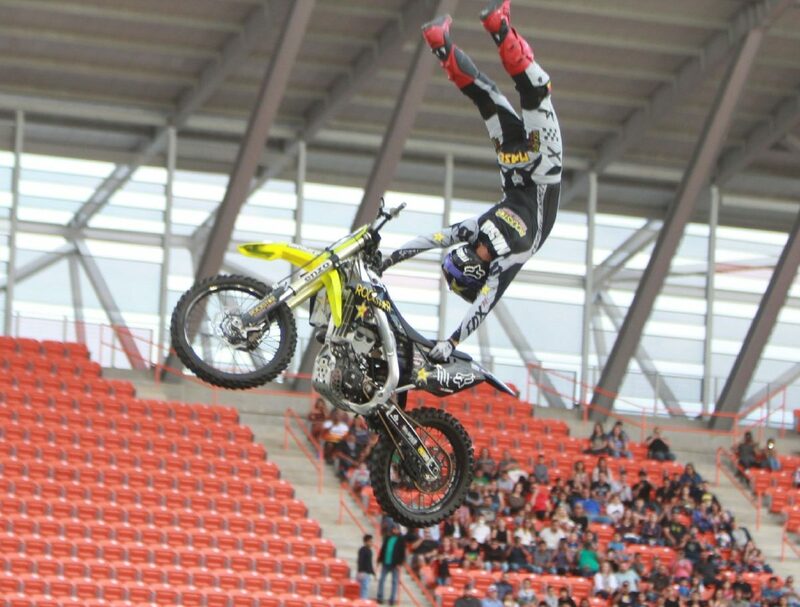 Jacob Bailey, a stuntman with Nitro Circus, is seen doing a stunt at H-E-B Park in Edinburg on Saturday, April 28 2018. 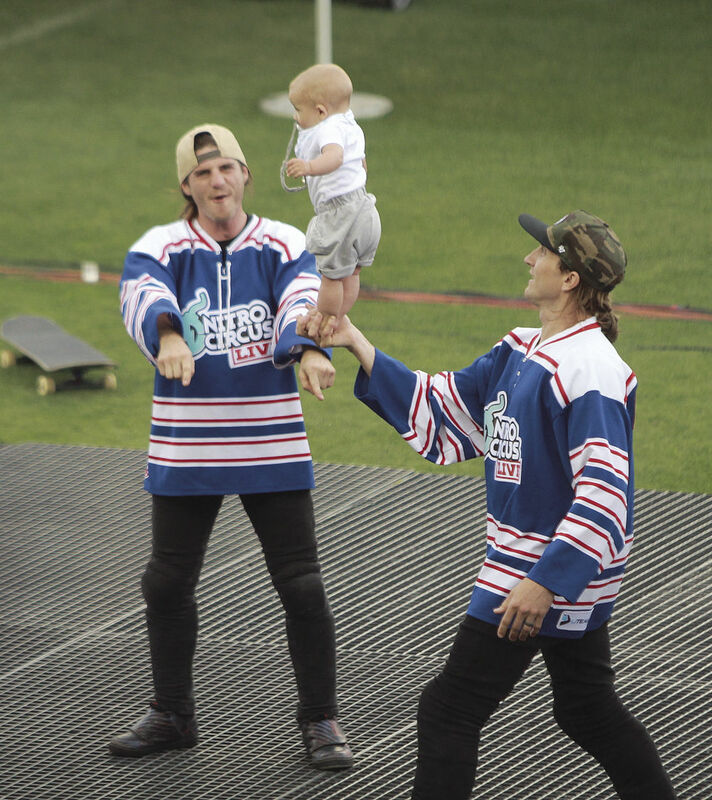 A stuntman holds his child on one hand before Nitro Circus Live at H-E-B Park in Edinburg on Saturday, April 28 2018. This is the first show of its kind to visit the Rio Grande Valley. In previous years, events like these couldn’t be staged in the region due to there not being an adequate venue. “It’s great to see how much the Valley has grown,” said Yajaira Flores, director of booking and marketing for H-E-B Park. Since the venue opened last year, more diverse events have been able to come to the area, Flores said. “In the last 16 years entertainment has grown so much and the level of production and work that everybody’s doing has elevated to a completely different level to where you don’t have to go to San Antonio or Austin to be able to experience these big events,” she said. 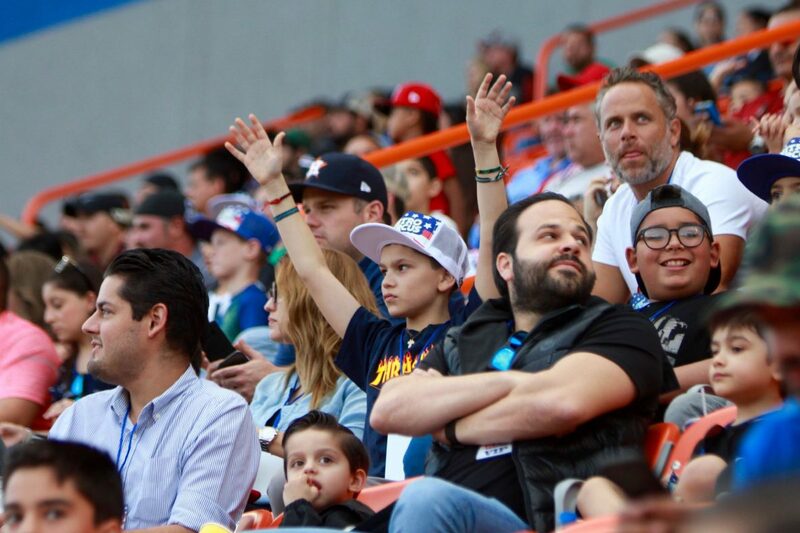 Jill and J.C. Canales often bring their two children to H-E-B Park to enjoy events ranging from the usual Toros game to events like Nitro Circus Live. The Harlingen family rarely spends a weekend at home now, they said.